Any kind of switch contact can be designed so that the contacts “close” (establish continuity) when actuated, or “open” (interrupt continuity) when actuated. For switches that have a spring-return mechanism in them, the direction that the spring returns it to with no applied force is called the normal position. Therefore, contacts that are open in this position are called normally open and contacts that are closed in this position are called normally closed. It is important to differentiate between a switch’s “normal” condition and its “normal” use in an operating process. Consider the example of a liquid flow switch that serves as a low-flow alarm in a cooling water system. The normal, or properly-operating, condition of the cooling water system is to have fairly constant coolant flow going through this pipe. If we want the flow switch’s contact to close in the event of a loss of coolant flow (to complete an electric circuit which activates an alarm siren, for example), we would want to use a flow switch with normally-closed rather than normally-open contacts. When there’s adequate flow through the pipe, the switch’s contacts are forced open; when the flow rate drops to an abnormally low level, the contacts return to their normal (closed) state. This is confusing if you think of “normal” as being the regular state of the process, so be sure to always think of a switch’s “normal” state as that which its in as it sits on a shelf. In standard electronic symbology, the figure shown above is reserved for polarity-sensitive capacitors. In control logic symbology, this capacitor symbol is used for any type of capacitor, even when the capacitor is not polarity sensitive, so as to clearly distinguish it from a normally-open switch contact. With multiple-position selector switches, another design factor must be considered: that is, the sequence of breaking old connections and making new connections as the switch is moved from position to position, the moving contact touching several stationary contacts in sequence. The selector switch shown above switches a common contact lever to one of five different positions, to contact wires numbered 1 through 5. The most common configuration of a multi-position switch like this is one where the contact with one position is broken before the contact with the next position is made. This configuration is called break-before-make. To give an example, if the switch were set at position number 3 and slowly turned clockwise, the contact lever would move off of the number 3 position, opening that circuit, move to a position between number 3 and number 4 (both circuit paths open), and then touch position number 4, closing that circuit. When movable contact(s) can be brought into one of several positions with stationary contacts, those positions are sometimes called throws. The number of movable contacts is sometimes called poles. Both selector switches shown above with one moving contact and five stationary contacts would be designated as “single-pole, five-throw” switches. The normal state of a switch is that where it is unactuated. For process switches, this is the condition its in when sitting on a shelf, uninstalled. A switch that is open when unactuated is called normally-open. A switch that is closed when unactuated is called normally-closed. Sometimes the terms “normally-open” and “normally-closed” are abbreviated N.O. and N.C., respectively. 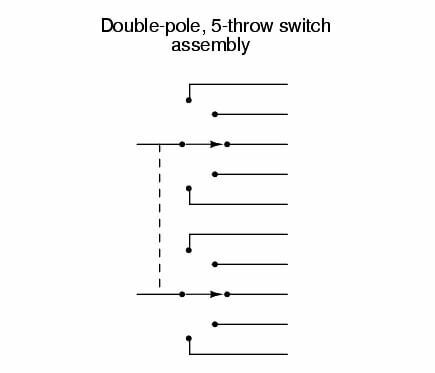 Multiposition switches can be either break-before-make (most common) or make-before-break. 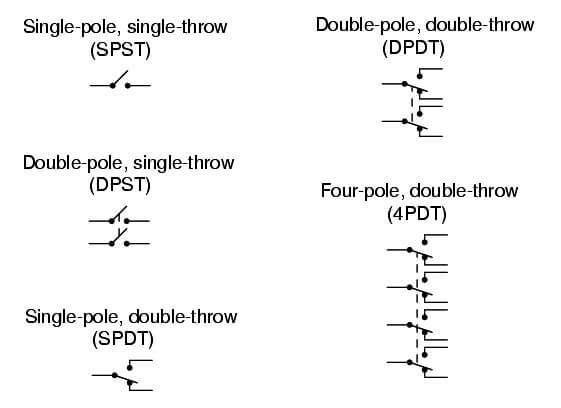 The “poles” of a switch refers to the number of moving contacts, while the “throws” of a switch refers to the number of stationary contacts per moving contact.